What is the LENScience Senior Biology Seminar Programme? The LENScience Senior Biology Seminar Programme is a series of nine seminars that run on Thursday afternoons from 3:45-5:00pm from Term 1 to Term 3. Each seminar is based around the work of New Zealand scientists, linking the concepts you are learning about with their work. A very important skill for examinations. You meet with your teacher at school and discuss the seminar paper - this is a paper that has been written by a teacher and scientist to explain the work of the scientist and link it to concepts you will learn about this year. You can submit questions about the paper to this wiki site. You "attend" the live seminar either via the Satellite Television Broadcast, NEN Broadcast (you can watch these from your classroom) or by being in the live audience if you go to a school close to the Liggins Institute. You can ask questions at the end of the seminar either via the wiki before the seminar starts or the live chat room during the seminar. There will be teachers in the live chat room during the seminar to take your questions. We will do our best to put all questions to the live seminar. At the end of the seminar you will be presented with "challenge questions". You are expected to think about these and submit your ideas to the wiki site. You meet with your teacher at school and discuss the "challenge questions". Each school is responsible for submitting some ideas about how to answer these to the wiki site. "It provided me with in-depth information and discussion about biology that we wouldn't be able to do in class"
"The wikichat was such a good idea - some very intense debates that were very thought provoking"
"I am a visual learner so the resources on the wiki site were useful and I was able to read and take notes"
"Having the pre-seminar focus questions and post seminar challenge questions were really good because they required more scholarship level thinking"
"I found it [the seminar programme] really, really, really useful to understand some concepts of biology more deeply and understand what scientists do"
"The seminars linked ideas together, some of which don't get linked in class so that was useful"
"Thanks so much for the opportunity to ask real scientists my questions"
"I was able to use ideas I gained from the seminars in my school work"
"It has extended my knowledge in the concepts of real life situations relating to topics done in class"
You may be interested to know that I received the Top Subject Scholar award for Biology (i.e. I had the best Biology scholarship result out of the whole of New Zealand) and I definitely believe that the biology seminars helped me with that." If you would like to participate in the programme, please talk to your Biology teacher. How do I know if my school has registered? Check on the school registration page to see whether your school has registered. This is a FREE PROGRAMME open to all Year 13 Biology students in NZ schools. What if I am the only biology student in my school? If you are in an area school or home school situation where you are the only biology student or in a very small class - you are most welcome to participate. If you are in a school, please ask your teacher to register your school. 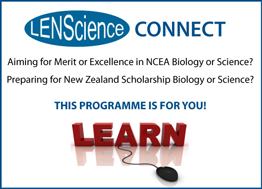 If you are home schooled please contact us at LENSciencehelp@auckland.ac.nz include your name and contact details.